Located in Shinjuku, the observatory lets you take in a gorgeous view of the city free of charge. It’s the matipid girl’s alternative to the Tokyo Skytree. Japan will be a haven for matcha lovers, since there are plenty of cafés to explore like Charyo Tsujiri and Umezono in Kyoto and Uge En and Marufuji in Osaka. But if you’re looking for a quick fix in Tokyo, order the signature parfait or any of the other sweets in Gion Tsujiri. If you’re looking for a little more fun and you’re in Shinjuku, you have to visit one of the unique establishments there. How about the Robot Restaurant? There are also other eateries with themes like Alice in Wonderland, Japanese samurai, prison, Capcom, and Medieval Times. Located in central Tokyo, this trendy shopping center houses all things fancy—from designer fashion brands and jewelry to coveted cosmetics. The building itself is super IG-worthy with its one-of-a-kind architectural design. Then, just a few steps away, you can see the zelkova tree-lined avenue that makes a great backdrop. And uploading shouldn’t be a problem since there’s free Wi-Fi called the “OMO-Free” service all around the area. On the other hand, if you’re looking for more budget-friendly souvenirs, you can check out the Daiso store near Harajuku Station. The store offers all kinds of goods at 100 Yen (around P50) per piece! PSA: There are plenty of other Daiso outlets around the country, too. Here’s another shop you can check out for bargain finds. You’re bound to find various snacks, cute home items, stationery supplies, toys, and even costumes. With over 300 stores around Japan, Don Quijote (or “Donki”) will make souvenir shopping a breeze. There’s one for every interest. Go to Akihabara for gadgets and merchandise from your fave anime, manga, or J-Pop idols. Head to Ginza, Aoyama, or Shibuya for stylish outfits and Harajuku for vintage and eclectic pieces. You can also check out Asakusa and Kuramae for souvenirs. Of course, we can’t talk about Japan without covering ramen. One that’s bound to pop up in conversations about ~*special*~ ramen experiences is the famous Ichiran. Dubbed as the “the world’s best,” Ichiran lets you customize the ramen exactly how you like it. Another must-try is Ramen Jiro—specifically the original branch in Mita. You line up for about 45 minutes, and you get served with a huge bowl of goodness. Tourists advise sharing and warn to not order the larger bowls for the sake of your sanity. LOL! For the artsy ladies, why not try the dainty arts of the Japanese? You can sign up for classes for activities like shodo or calligraphy, ukiyo-e or woodblock printing, and ikebana or flower arrangement. You can even try cooking, cultivating bonsai, and kimono-dressing. 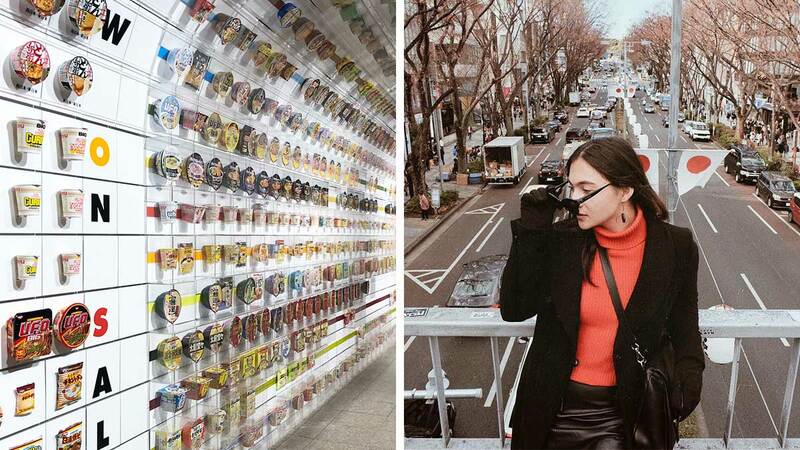 An ode to one of our favorite instant foods, this unique tourist attraction walks you through the colorful history of instant cup ramen. Admission is free! You’ll only be charged 500 Yen if you join the Chicken Ramen Factory or 300 Yen for the My CUPNOODLES Factory where you can create or customize your own cup. This underrated city has a colorful array of things to do and yummy dishes to conquer. Go to a beer museum, take several snaps at a huge sculpture park, shop at markets, and visit soup curry restaurants or sweets shops. There’s even the Sapporo Snow Festival every February. In the heart of the region called Kansai lies Kyoto, a city rich in history and home to various landmarks in Japan. This is where you can stroll through the Bamboo Grove in Arashiyama, the Sagano Scenic Railway (which looks heavenly during springtime with all the sakura trees), and the Fushimi Inari Shrine. It’s the perfect place to don a kimono and channel your inner geisha! Also in Kansai, this ancient capital of Japan allows you to see eight Unesco World Heritage Sites, including daibutsu or the Great Buddha in Todaiji Temple. Be sure to stop by Nara Park—the surroundings are so peaceful, you’ll even spot some deer in the area.